Hope you all had a wonderful Christmas. I know I did. Wishing you all a Happy New Year!!! I made this bread for my family and they were blown away (and believe me, they are tough critics when it comes to food). I kept hearing them say . . .
Best bread I have ever eaten! I could eat this bread forever. When are you going to make this again? In fact, I made two mini loaves that night and my dad and sister devoured the first loaf in record time. The second loaf was gone by the next afternoon. 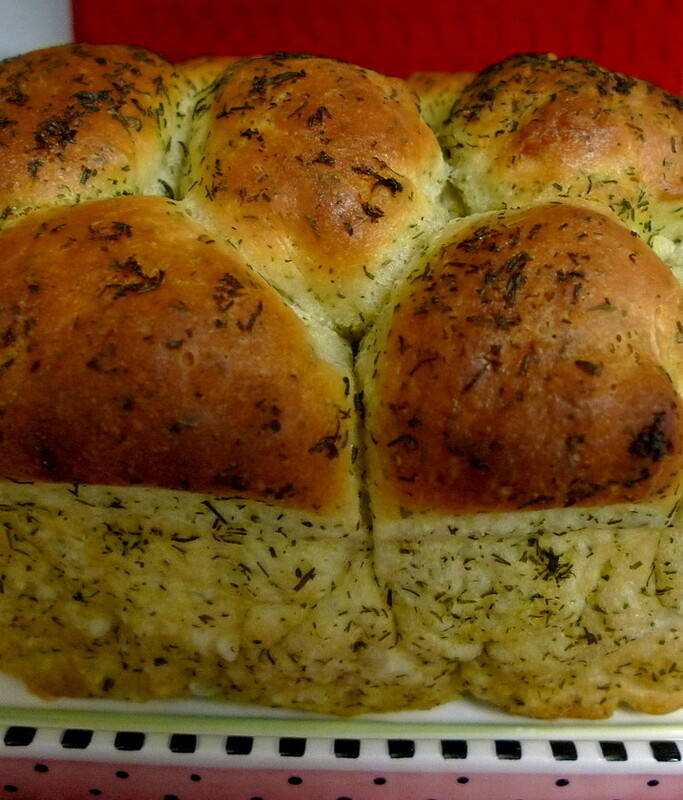 The dill flavor is not at all overpowering and it's just fun to pick off the little buns and eat them one by one. 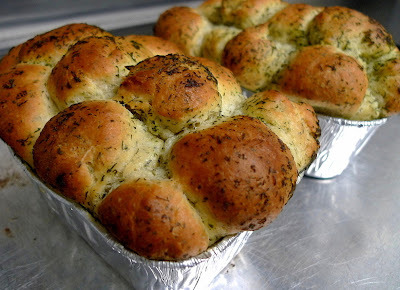 I highly recommend making this and eating it warm right out of the oven. It's the best! Combine the warm water, yeast, and sugar and let sit for 10 min. until foamy. Add the milk, egg, butter, and dill to the yeast mixture. Add the salt and the flour gradually until the dough no longer sticks to the bottom of the bowl. Knead lightly by hand and place the ball of dough in a greased bowl. Cover with plastic wrap and let rise in a warm place for 30-60 min. Meanwhile, combine 2 Tbsp. of melted butter with 1 Tbsp. dill to make the dill butter. Once the dough is ready, punch it down and shape into 1-inch balls. 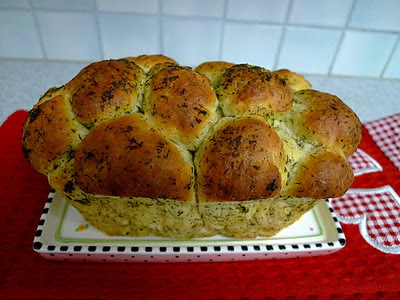 Dip each ball into the dill butter and place in small greased ramekins or mini loaf pans (I used two mini loaf pans). The dough will rise more, so don't cram too much dough into too small a space. Cover the loaves with plastic wrap and allow to rise for another 20-25 min. Preheat your oven to 375F. Right before baking, brush some of the remaining 2 Tbsp. of melted butter over the dough. 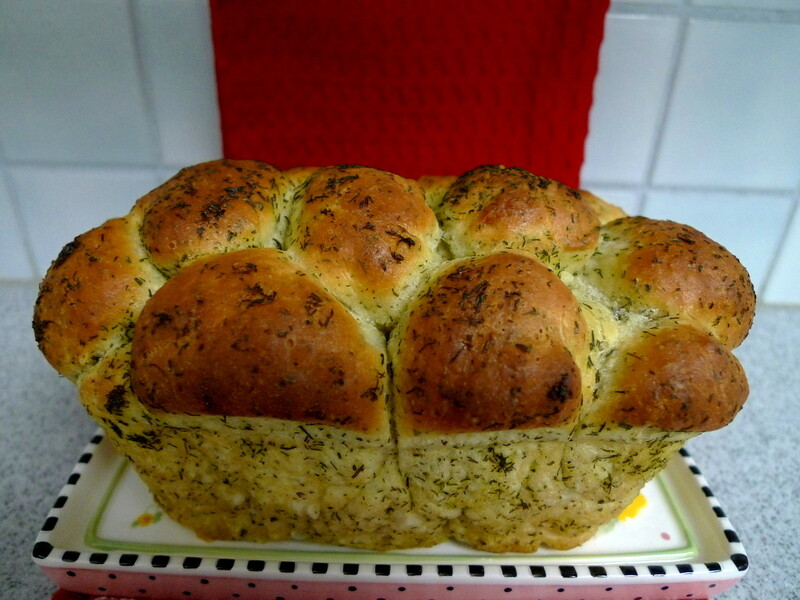 Bake for 15-20 min., brushing again with the butter twice throughout the baking process. Enjoy warm from the oven. I had previously made a savory monkey bread for my sister. She absolutely loved it. 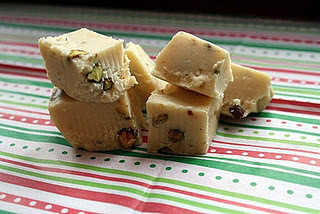 Then, I told her about the buttery, sugary version of it, and well, she begged me to make that too. I agreed. Since I've had pumpkin yeast bread on my to-do list for practically forever, I knew I wanted to do a pumpkin version of it. I used the pumpkin yeast bread recipe found on Willow Bird Baking, and then took it from there, adding my own twists on it. 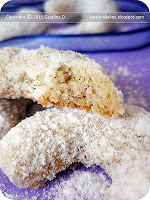 Instead of rolling the dough in cinnamon-sugar, I rolled them in a mixture of sugar and my chai spice blend. For comparison, I also made one loaf with cinnamon-sugar. I couldn't wait for the loaves to be done. They smelled so good baking away. Peeking in the oven, I could see a beautiful sugary crust forming on top with little rivulets of butter melted in between the mini buns. My family eagerly tried the breads. The chai spice version won hands down. My sister said she could taste the pumpkin in it more and that the flavor of the spices really blended well with it. I think the only changes I'd make next time would be to add some spices to the bread itself to pump up the flavor even more and use brown sugar instead of white sugar for rolling the dough. But, other than that, these were fluffy, sweet mouthfuls of bready bliss. Grease three mini loaf pans and set aside. Heat the milk to 100-110F and melt the butter in it. Stir in two teaspoons of sugar and the yeast and let sit until foamy, about 5-10 min. Add the pumpkin and salt and gradually add the flour 1/2 cup at a time until the dough no longer sticks to the bowl (it will still be slightly sticky but not tacky). Knead until smooth and elastic. Put the dough into a greased bowl, cover with plastic wrap and a dishtowel, and let rise until doubled, about 1 hour. When dough has doubled, punch it down and roll into 1-inch balls, about 40-50 of them. 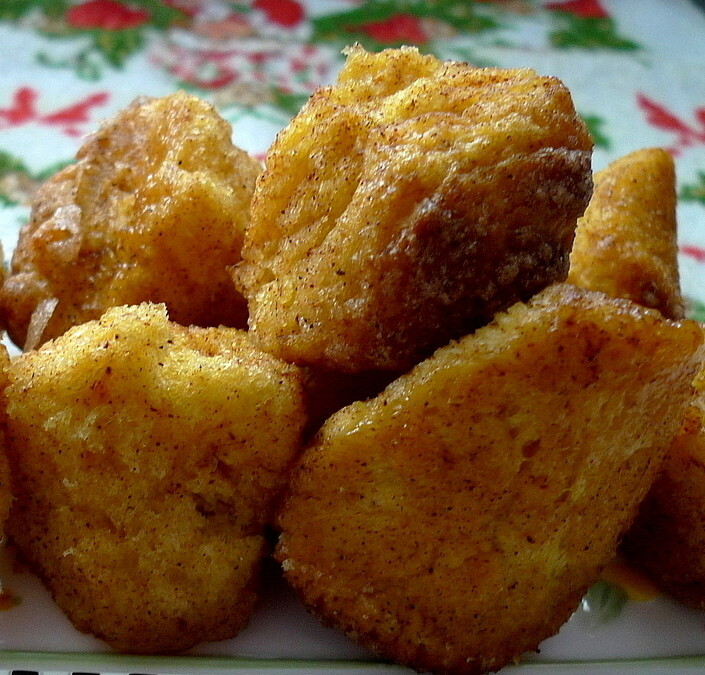 Roll them in the melted butter and then in the mixture of sugar and chai spice. Stagger the balls of dough in the loaf pans (do not put them in too tightly). Cover with plastic wrap and let rise another 30 min. Preheat your oven to 375F. Bake the loaves for 20-22 min. until golden brown on top. I can't believe that Christmas is already this weekend. Hope you're having a wonderful holiday. As for me, my quest for The Best Ginger Cookie by Christmas has finally ended! Twelve recipes, tons of taste testing, and cookies galore, and I've finally found some wonderful favorites that will be keepers. Wanna know which recipe won? They look like they're covered with lightly fallen snow. What a fun, fudgy idea! 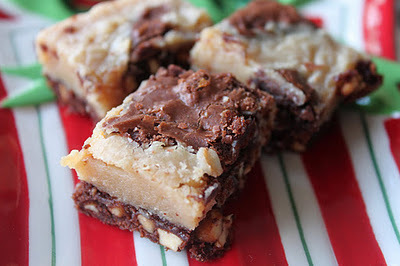 Tons of fudge recipes to make your mouth water. The end of the quest at last!!! But, before I announce the winner, here are the final recipes. The last two cookies out of the dozen recipes I tried were Martha Stewart's Ginger Cookies and the Chewy Gingerbread Cookies from the blog, "Fork Fingers Chopsticks." The cookies from Fork Fingers Chopsticks had the best texture out of any cookie I tried. They were so rounded and thick and crackled on top to boot. However, the taste was a little milder than I would have liked. Preheat oven to 350 degrees. Adjust racks – one in top 1/3 oven – second in bottom 1/3 oven. Peel and grate fresh ginger; set aside. Finely chop crystallized ginger; set aside. In a large bowl, whisk together the ground ginger, cinnamon, cloves, flour, baking soda and salt. Add crystallized ginger, separate if it clumps and stir to incorporate. Set aside. In a medium-size skillet or small pot, over low heat, add butter – when it has melted almost half way. 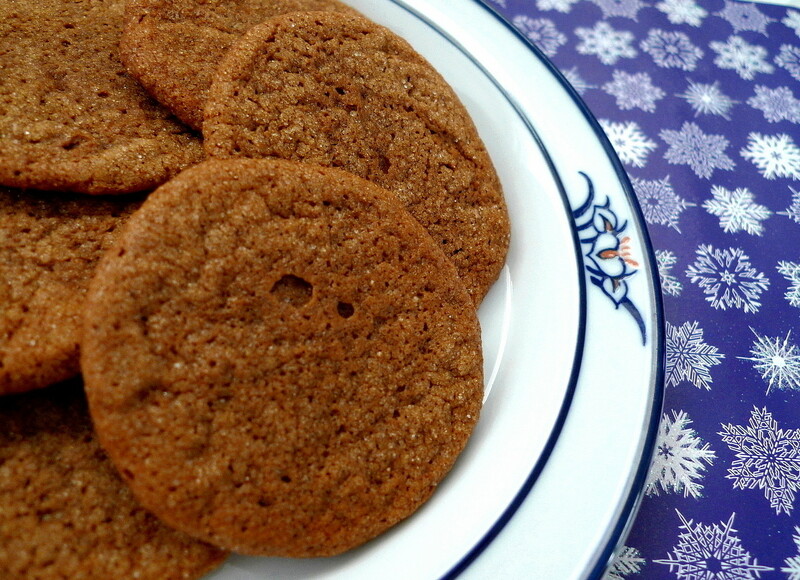 Turn off the heat and add the fresh ginger, brown sugar, molasses. Mixture should be warm to touch not hot. Add beaten egg and stir to incorporate. Pour over flour mixture. 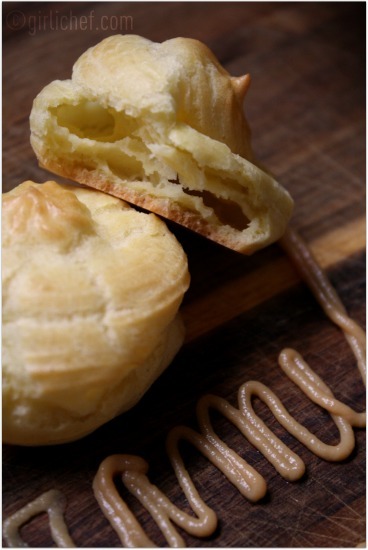 Stir until combined – do not overwork the dough. Shape dough into balls (1/2 tablespoon dough for small cookies – 1 1/2 inch; 1 heaping tablespoon dough for 3 inch). 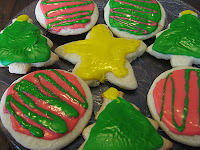 Balls should be placed at least 2 inches apart for smaller cookies/ 3 inches for larger. *Optional: For a prettier cookie, coat each ball with large granule sugar/sea salt before baking. Bake for 8 to 9 minutes for small cookies; 10 – 12 for larger. Cookies are done when they have risen and cookies crack. Do not overbake – underbaking is better. Store in airtight container for about 1 week. On the other hand, the Martha Stewart Ginger Cookies had great flavor to them. But, they came out flatter, though still wonderfully chewy. Flavorwise, my family also preferred Martha Stewart's to the ones from Fork Fingers Chopsticks. And now . . . the winner and some honorable mentions. These were hands-down the winners in terms of taste. Perfectly spicy without any one spice overpowering the others. One bite will leave you wanting for more. The texture was a little too soft, but my family and I still gave them a thumbs up in terms of taste. Besides, they're fat free. You can't beat that. I'd indulge in these anytime. While we wish these would have been thicker, we still couldn't deny that Martha Stewart knows her stuff when it comes to ginger cookies. The flavor was spot-on good. Well, it's been quite the quest. I don't know if I can look at another ginger cookie, at least anytime soon, but I've still enjoyed myself. 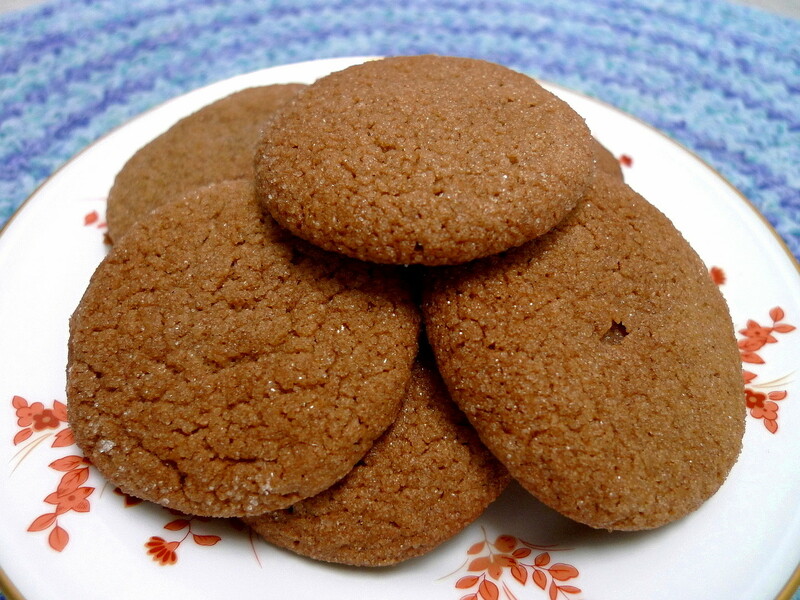 More importantly, I've finally found ginger cookie recipes that will be keepers in my book. 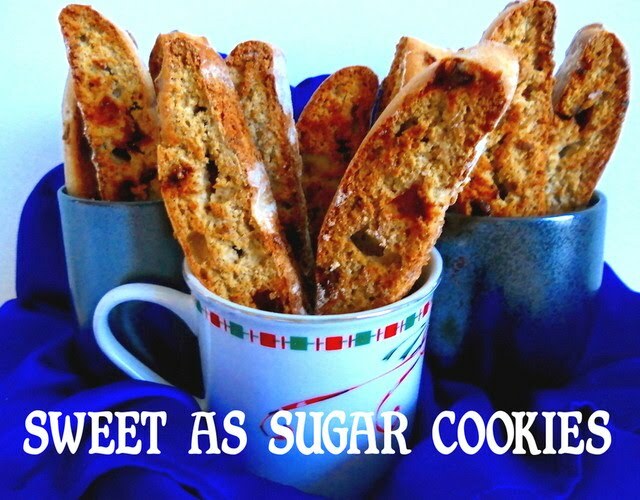 Thanks so much for following me along on my journey and I hope you'll be able to try some of the winning cookies. Merry Christmas! It's true that the holidays are for indulging. Still, wouldn't it be nice to have your cake and eat it too, or in this case, eat your cookies and NOT have to run yourself ragged at the gym the next day? 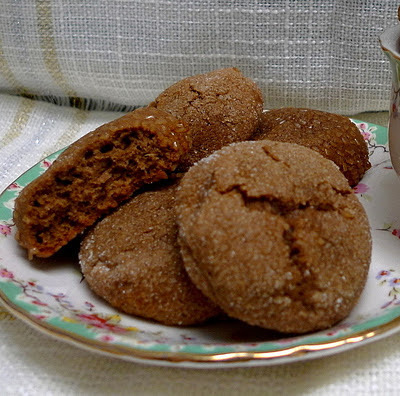 Enter David Lebovitz's Gingersnaps. They're totally fat free, using applesauce in place of butter and egg whites instead of whole eggs. His gingersnaps are actually based off of Ina Garten's Ultimate Gingersnaps, which I blogged about earlier in my quest. He changed it up though by adding more ginger and decreasing the cloves. This totally remedied the critiques I had about her recipe - not enough ginger and too much cloves. He also adds a good amount of black pepper. I was curious to see how they would taste with his improvements. The cookies really were quite good. In fact, we loved how they tasted and you don't miss the fat at all when it comes to flavor. But, apparently, omitting the butter leads to a slight problem in texture. 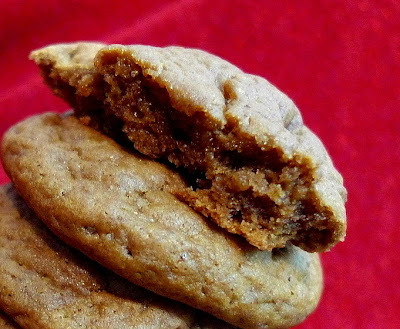 The cookies, though baked through, were a little too soft, and quite gooey on the bottoms. Of course, if you don't mind that sort of thing, then these will definitely be the cookie for you. Besides, the fact that they're fat-free is a big plus and I like that I could indulge on these without the guilt. On that basis alone, I would make these again for sure. Stay tuned because the last two ginger cookie recipes will be posted later today. Then, the final winner will be announced on Friday morning. 1. In the bowl of a standing electric mixer, beat the brown sugar, applesauce, and molasses for five minutes at medium speed, with the paddle attachment. 6. To bake the cookies, preheat the oven to 350F (180C). 8. Pour some cinnamon-scented granulated sugar in a shallow baking dish. Scoop the cookies into heaping tablespoon-sized balls (about the size of an unshelled walnut) and plunk them down into the sugar. Afterward, use your hands to form the dough into sugar-coated balls: don’t be shy with the sugar either. It not only helps to shape the sticky dough, but makes a lovely crust for the finished cookies. Note: DL uses 1/2 cup plain applesauce and cooks it down to a thick paste amounting to 1/4 cup. According to him, this makes for a denser, chewier cookie. These Ginger Cookies by Sugar Baby's Gesine Bullock Prado was also a popular recipe that I found when scouring other food blogs. What caught my eye was that it called for adding some white pepper in addition to the other spices. 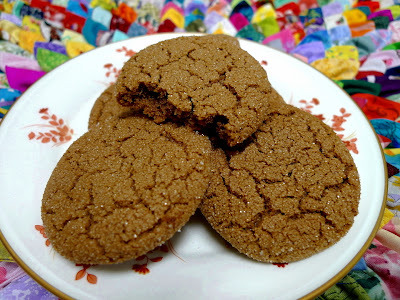 Since I like a little heat in my cookies, I decided that I had to try this recipe as well. 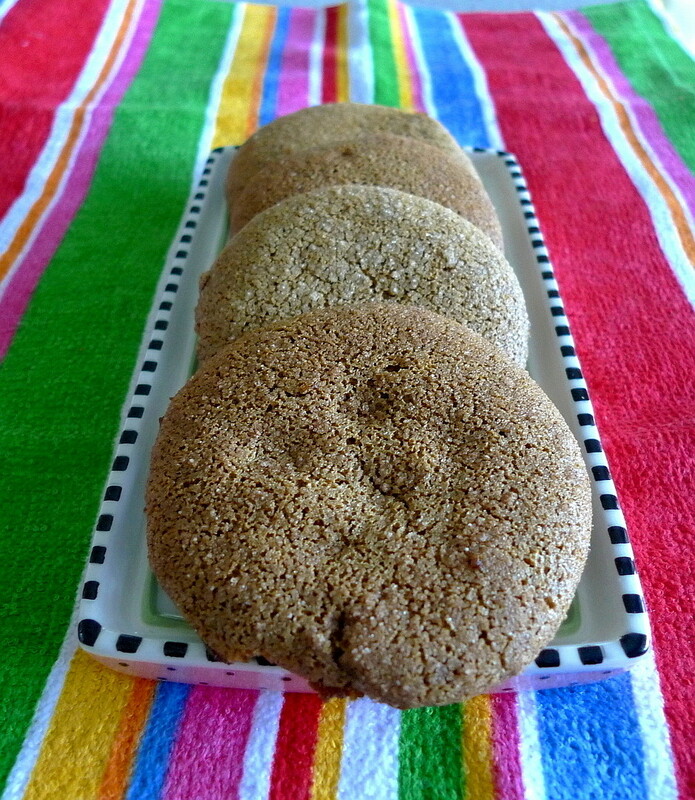 The baked cookies didn't have that crackled look, but they were still thick and chewy. I could definitely detect the heat from the white pepper and, unlike the Ina Garten Ginger Cookies, this time I could taste the ginger. But, even then, the taste still failed to wow my family and I. 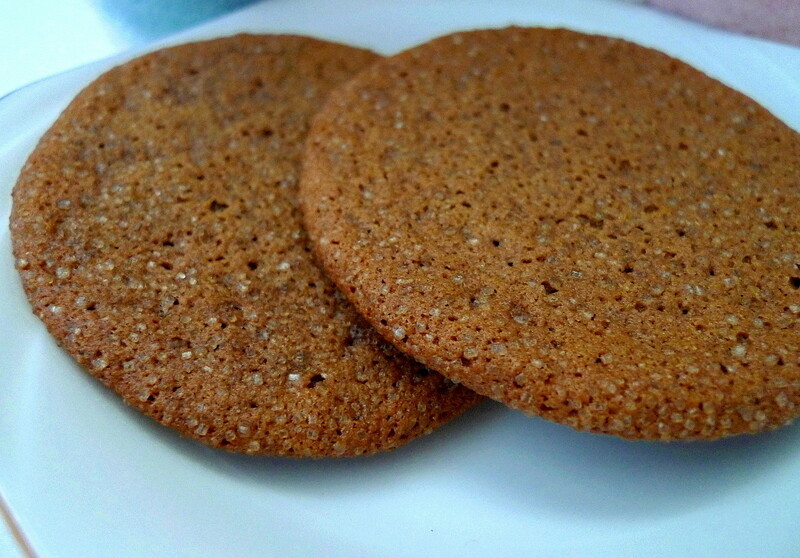 Somehow, it just didn't have that flavor that I always think of when I think of ginger cookies. But, there's still three more recipes left to try before this search ends and I have a few frontrunners in mind as well. As to which one will be the winner, all will be revealed by the end of this week. Preheat oven to 350 degrees F. In the bowl of a stand mixer fitted with the paddle attachment, cream the butter, white sugar, brown sugar, and molasses until light and fluffy. Add the eggs, one at a time, incorporating well after each addition. In a separate bowl, whisk together the flour, baking soda, ginger, cinnamon, cloves, nutmeg, salt, and pepper. With the mixer on low speed, gently add the flour mixture until just incorporated. Be very careful not to overmix. Fold in the crystallized ginger and chill the dough, covered, for a few hours or overnight. 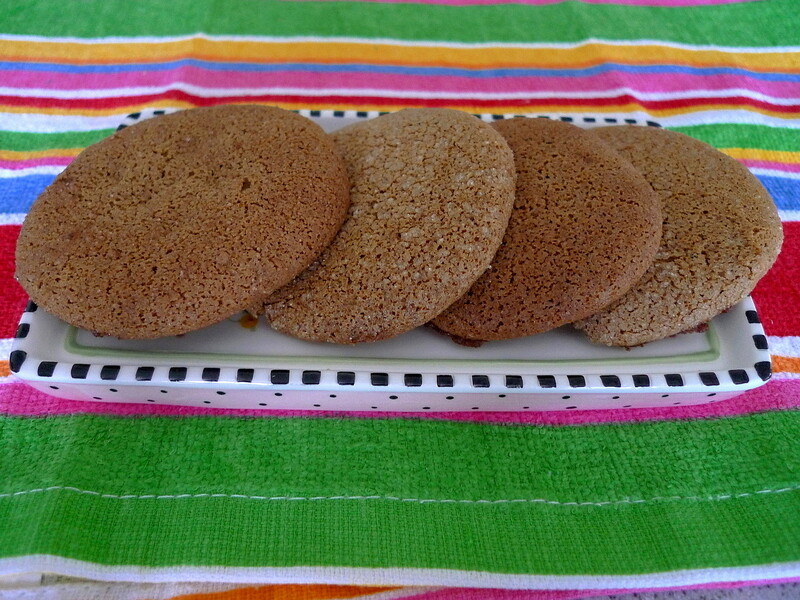 Using a large cookie scoop, scoop the cookies and dip them in sanding sugar so that they are completely coated. Place the cookies on a parchment-lined sheet pan, spacing them 2 inches apart to allow for spreading. Bake for about 15 minutes. The cookies will crack a bit but should still be soft in the middle. Place on wire racks to cool. Makes about 30 cookies. This recipe had tons of reviews on the Food Network website and many bloggers have raved about it as well. So, I just had to see what everyone was talking about and decided to try Ina Garten's Ultimate Ginger Cookies. There are several things that set this recipe apart. One is that they are made with oil instead of butter. Secondly, they have very little ginger powder in them. However, they do have a lot of ground cloves. I wondered how all this would affect the taste. As you can see, the cookies came out beautifully. They have that classic crackled look on the top and they were also thick and chewy, just how I want my ginger cookies to be. Tastewise, however, they were simply "meh." I couldn't detect any ginger flavor in them, which is not surprising since I mentioned that the amount of ginger powder is clearly outnumbered by the other spices. I could detect the flavor of the cloves which was a bit off-putting. Plus, I think you really do need the flavor that can only come from butter. No offense to anyone who has tried this recipe and liked it. But, as for my family and I, the search still goes on. By the way, today will be a double posting day. 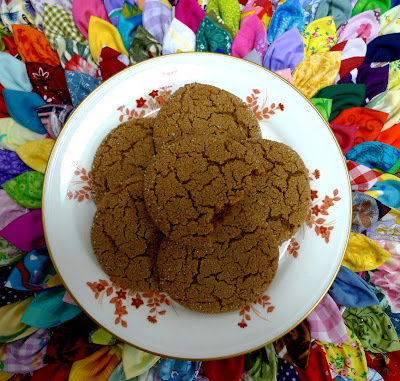 Look out for Ginger Cookie #9 later this afternoon. Preheat the oven to 350F. Line 2 sheet pans with parchment paper. This week's Top 5 was a pleasant surprise for me. I found out that my treat actually made it to the top #1 spot! But, since the main purpose is to spotlight all of YOU, I'm sharing the Top 6 from this week. Enjoy! Just when I thought I was doomed to have flat cookies forever, it happened. I got my thick and chewy cookies! It could be because there's no eggs in this recipe. 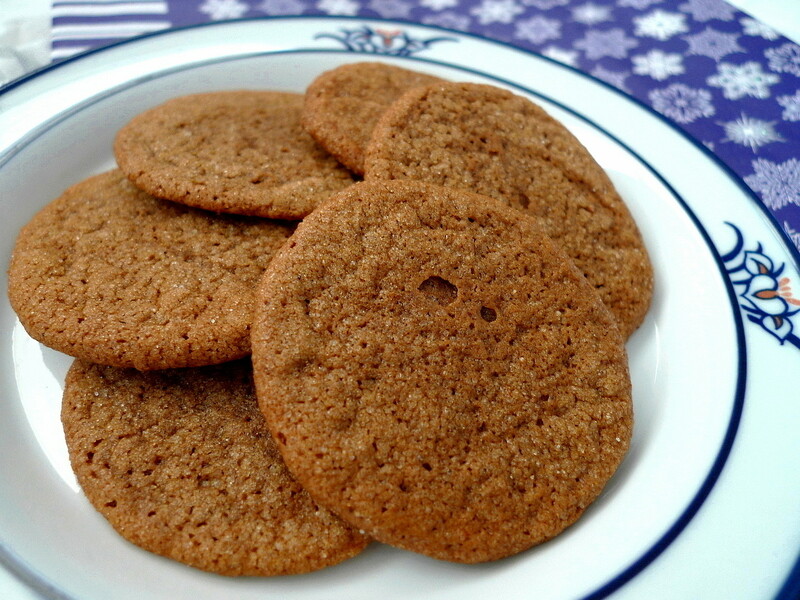 Instead, an equal volume of milk is substituted, hence there's less fat in these cookies. Less fat means less spreading in the oven, or so I've heard. It could also be because I also increased my baking temperature to 375F in hopes of getting the cookies to set quicker before any spread could occur. But, whatever the reason, these cookies puffed in the oven, stayed puffy even after cooling, and resulted in yummy bites with that cakey chew that I so long for. 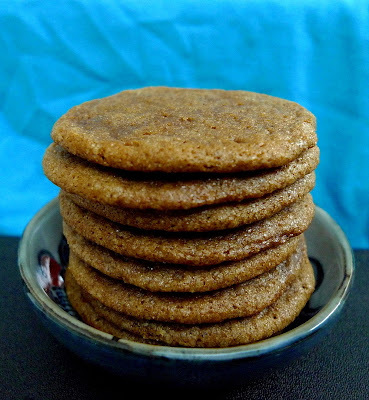 Plus, these cookies have a ton of ginger powder in them and very little amounts of other spices, so the ginger flavor really shines through. At the same time, it is not at all overpowering. I'm glad I got to try these neat little cookies because they turned out great! Preheat oven to 350°F. Coat a large baking sheet with cooking spray or line with parchment paper. Sift flour, ground ginger, baking soda, cinnamon, cloves and salt into a medium bowl. Combine granulated sugar, oil, molasses, soymilk and vanilla in a large bowl with a whisk or electric mixer on medium speed. Stir in crystallized ginger and fresh ginger. Then stir in the dry ingredients until well combined. The dough will be sticky. damp hands, shape the dough into 30 balls (about 1 tablespoon each). 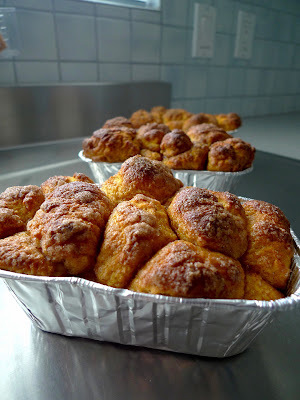 Place about 12 balls on the prepared baking sheet about 2 inches apart. 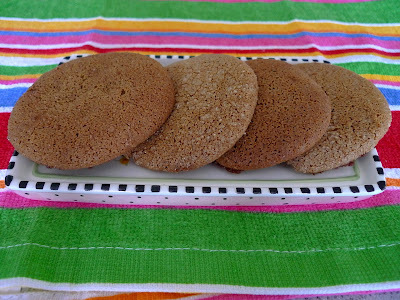 Press turbinado sugar onto the top of each cookie. 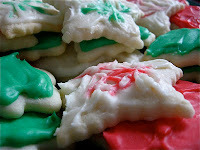 (If you don’t have coarse sugar, you can sprinkle the top of each cookie with a little granulated sugar instead.) Bake the cookies, one batch at a time, until slightly puffed and beginning to brown around the edges, about 10 minutes. Transfer to a wire rack to cool. Repeat with the remaining dough. 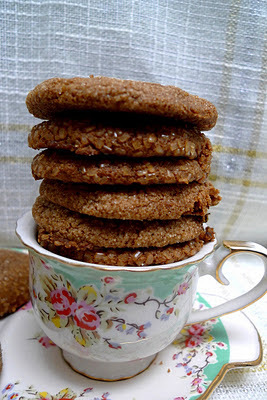 These cookies come from Bon Appetit's site and are somewhat similar to the Crackly Topped Spice Cookies I made last week. The difference is that there's no cayenne pepper or nutmeg in them. Based on this, I was curious as to whether they could possibly be as good as the other cookies. After all, I do like my cookies spicy. But, when all was said and done and cookies were baked, I was pleasantly surprised. These cookies still had a lot of delicious flavor in them. True, they weren't quite as spicy as the other cookies, but they were really very good. Unfortunately, I couldn't get my cookies to be thick, chewy, and puffy like I wanted. I've pretty much resigned myself to the fact that until I replace my oven, it'll be flat cookies all the way. But, at least they'll always be tasty either way. If you're not the kind of person who likes a lot of heat in your cookies, then these would be a great alternative. Woo-hoo. We're halfway through the quest! Combine first 6 ingredients and whisk to blend. Mix in crystallized ginger if desired. Beat brown sugar and butter until fluffy. Add egg and molasses and beat until blended. Add flour mixture and mix until just blended. Cover and refrigerate 1 hour. Preheat oven to 350F. Spoon sugar in thick layer on small plate. Using wet hands, form dough into 1 1/4" balls. Roll in sugar to coat completely. 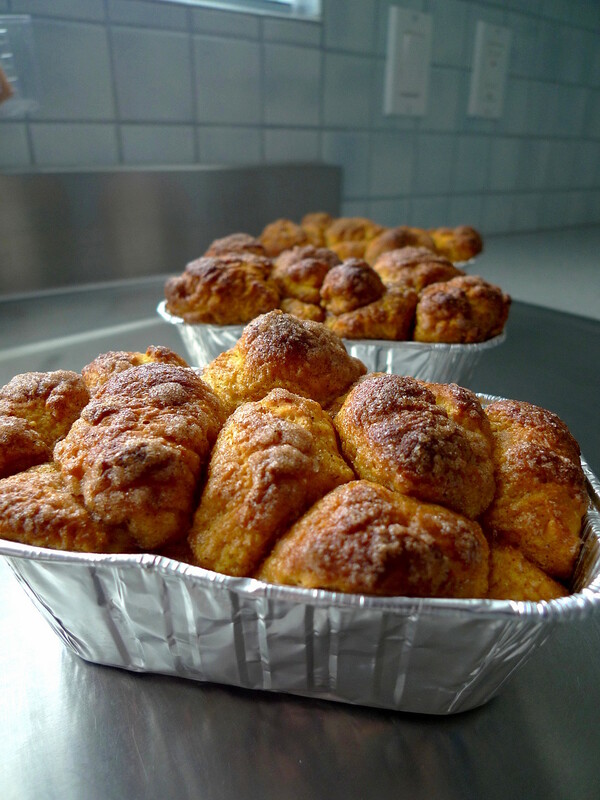 Place balls on baking sheets, spacing 2 inches apart. Bake cookies until cracked on top but still soft to touch, about 12 min. Cool on sheets 1 min. Carefully transfer to racks and cool. 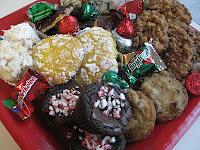 Have you ever heard of Anna's blog, "Cookie Madness"? It is full of treats of all kinds - cakes, pies, and of course, cookies. I've been reading her blog for some time now. 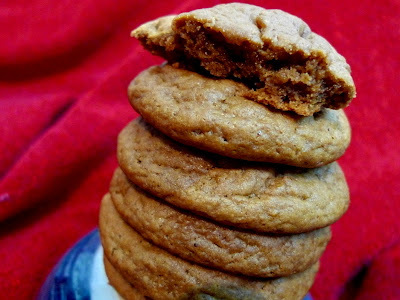 In fact, one of the recipes on her site, for the Ultimate Stand Mixer Chocolate Chip Cookies, made my fave list when I went on a search for the best CCC of them all. So, I figured that it was very likely that I might find THE ginger cookie recipe on her site. 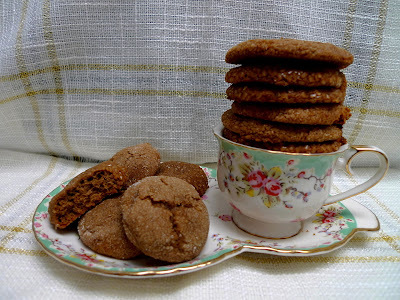 After perusing through a bunch of recipes, I settled on the Crackly Top Spice Cookies. Judging from the recipe, these cookies would be anything but mild. They have a whole tablespoonful of ginger powder AND cinnamon in them plus cloves, nutmeg, and cayenne pepper to bring the heat. Sounds like my kind of cookie. Mine didn't come out with the crackly tops, but appearance is not the most important thing. They were super chewy which is just how I like them. Then, as to their taste. With the first bite straight from the oven, I was speechless. It's like I could taste all the different spices individually as well as blended together into one lovely harmony. Then, there was just the tiniest bit of heat at the back of my throat from the cayenne pepper. It was surreal. 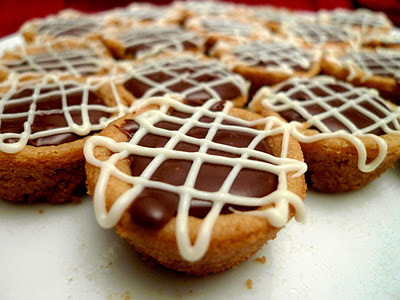 I have no doubt that these would be absolutely sensational drizzled with a little melted white chocolate. Looks like this is the frontrunner for now. First, mix together all the dry ingredients - flour through nutmeg. Set aside. Beat together the shortening and sugar until light and fluffy. Add the egg and molasses and mix well. Stir the flour mixture into the sugar mixture. Cover the dough and chill for an hour or overnight. Preheat the oven to 375F. Shape dough into one inch balls. Roll dough in crystal or coarse sugar. Place 2 inches apart. Bake for 10-12 min. or until the cookies are crackly looking and crispy around the edges. 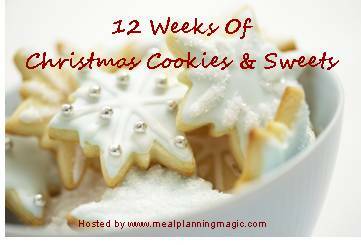 Woohoo, it's Week 11 of the 12 Weeks of Christmas Cookies! Yes, believe it or not, it's another Triple Ginger Cookies, this time from Alice Medrich. But, just because the name is the same as the other cookie, does not mean that the recipe is also identical. Alice's recipe differs from Emily's in a number of ways. First of all, there's a higher flour to butter ratio. Secondly, the butter is to be melted rather than simply softened. 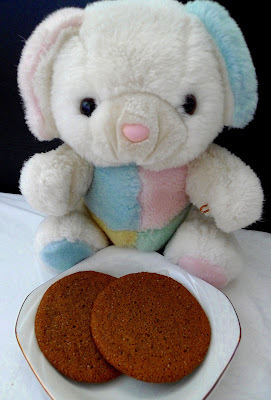 Third, this cookie has ginger powder (naturally) but it also has cinnamon and a little allspice. 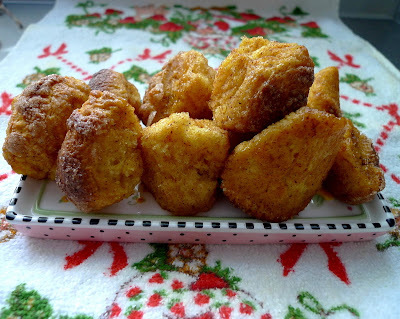 Fourth, unlike Emily's recipe which used only white sugar, Alice's recipe uses a combo of both white and brown sugar. Finally, there are 2 tablespoons of fresh grated ginger in these cookies as opposed to Emily's cookies which only had half that. This led me to believe that her cookie would be spicier and more flavorful than the one I posted yesterday and I just had to try it out and see if that was true. Well, as it turns out, these were the most flavorful out of all the ginger cookies I've made so far. They came out a little crisper than the others, but that might have been because I baked them a tad too long. Of course, there's no way to tell whether these will be THE best, especially since I've still got another spicy one to post today and a third batch of cookie dough sitting in my fridge. The search must go on! Position the oven racks in the top third and lower third of the oven. Line the baking sheets with parchment paper, or leave sheet unlined. In a medium bowl, combine the flour, baking soda, ginger, cinnamon, allspice, and salt in a medium bowl and mix thoroughly with a whisk or fork. Combine the warm butter, molasses, both sugars, fresh ginger, and egg in a large bowl and mix thoroughly. Add the flour mixture and chopped candied ginger and stir until incorporated. The dough will be soft. Form the dough into 1-inch balls (1/2 oz of dough for each). Roll the balls in the Demerara or raw sugar and place them 2 inches apart on the baking sheet. Bake, in batches (form the rest of the balls while the first batch is baking ), for 10 to 12 minutes, or until they puff up and crack on the surface and then begin to deflate in the oven. Rotate and turn the sheets about halfway through the baking time. For chewier cookies, remove them from the oven when at least half or more of the cookies have begun to deflate; for crunchier edges with chewy centers, bake a minute or so longer. Cool the cookies completely before storing.